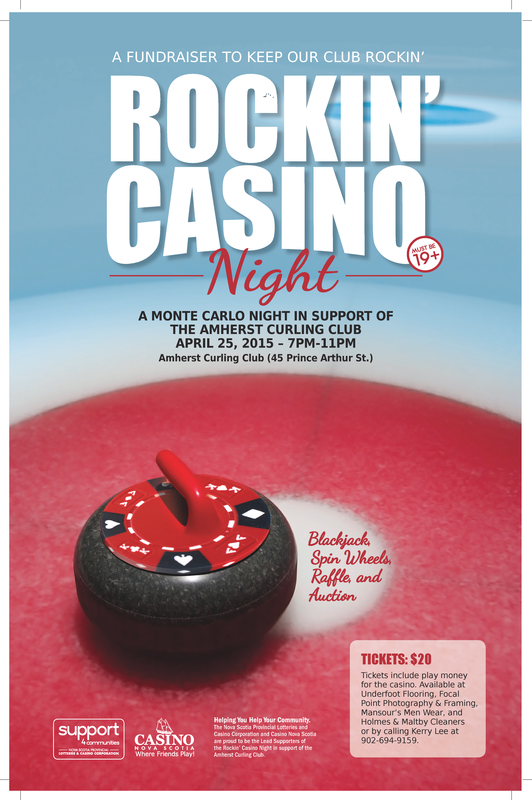 Amherst Curling Club will be hosting a Monte Carlo Night fundraiser on April 25th, 2015. Come on out and help keep our club rockin’! See the poster below for details. Saturday Night April 25th from 7pm -11pm the club is set for a Support4Communities Monte Carlo Fundraiser. Money raised will go towards the expensive upkeep of our building and toward plans for a main floor bathroom. Tickets are $20 and are available at; Focal Point Photography , Underfoot Flooring, Mansours Menswear & Maltby Cleaners or you can get them at the door. You don’t have to be there at 7pm to join in the FUNdraising, the door is open all night. Additional play money and raffle tickets will be for sale at the door. Your ticket will be transferred for $20 play money and your name will be entered into a raffle to win a club membership package. Play money will be used to play games of chance including; Black Jack, Plinko and Spin Wheel. Casino girls will be on hand to orient you and get you started on a fun filled evening. With your winnings you can bid on lots of silent auction prizes. The evening will also include a small live auction at 9pm where real money including credit cards will be excepted. Michael Cormier a talented Watercolor artist will be their live creating one of his master pieces, it will be the first item up for bid. The bar will be open for cash sales and light snacks will be set out upstairs in a lounge like setting. If you have any questions, concerns or want to make a huge donation please do not hesitate to call or e-mail. Happy Spring everyone. Hope to see you there.